Buying a home can probably be the most expensive investment you will make in your life, so how you pay for it is a monumental decision. There are so many products available to home buyers; you have to do your homework before deciding on one mortgage. Know your credit report and credit score. Yes, this number is really important. It affects the rate and amount you get to borrow or if you qualify to borrow at all. Start by obtaining a copy of your credit report and get your score if you are even thinking of buying real estate. Things that bank looks at on your report are, some open accounts, the amount of available credit, late payments, paid off accounts and on-time payments. Go through and close all accounts you don’t use, resolve what issues you can and don’t open any new accounts until or after the mortgage is secured. 1. Conventional Loans- This loan allows you to lock into a rate and sets your payments up for a 30 or 15 year period. If you plan to stay put, this is a fairly a no-risk option. 2. Adjustable Rate Mortgage (ARM) – Many banks are offering ARMs these days. 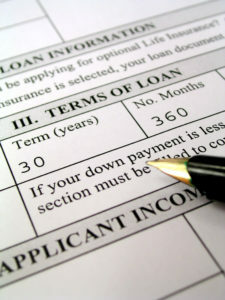 This type allows you to take out a loan at a low rate. There is usually an option of 3, 5, or 7 years to lock in this rate. After this time is passed, your loan is at the mercy of market rate changes. If you know you will be moving in 3 years, this type of loan may be a good for you. However, have it in mind that your payment will go up at some point and budget for this spike. Just because that low initial rate allows you to afford a certain home, you have to consider the long-term financial commitment so that you don’t get into trouble. 3. Interest-only loans- This type is exactly what it says. Your payment is on the interest only. It may allow you to afford the home, but in the long run, it may not be a good idea. If you decide to sell it at some point, you will find that you have no equity in the real estate property and if market values have fallen, you will owe more than it is worth. 1. Mortgage rate and APR- The mortgage rate is what the bank is offering on your loan. The APR is the actual rate you will pay after fees. 2. Discount Points- you can buy these to reduce your APR and some fees. 3. Private mortgage insurance (PMI)- this is tacked onto your payment if you don’t have a 20% down-payment as a protective measure for the lender; in case you default on your loan. 4. Escrow- also added to your final payment. This account is for paying the taxes and insurance on your real estate property throughout the year. Know what documents you need. Gather all W-2s and tax returns for the past couple of years; several months back pay stubs, bank statements of the past couple of months. You will need all of these as proof of income when you apply. As you can see, there are plenty of things to consider, when financing real estate. If you have a hard time putting it all together, don’t be afraid to ask questions to your lenders or get a financial planner to help you to work it out. The most important thing is to arm yourself with knowledge and carefully consider all of your options before jumping into this monumental financial commitment. Work with your mortgage broker or lender to develop an individual loan or mortgage program based on your creditworthiness. Thinking positive about your future and how it relates to your real estate financing is important, but you must be realistic. Also don’t be afraid to ask a few real estate agents if they know of any tips to save you money when you go for a home mortgage and what to avoid. Ask homeowners how they’re doing, how they’ve saved money on their loans and what real estate and mortgage pitfalls to avoid too.